Registration is not required. Training lasts about 1 1/2 hours. Poll watching assignments are based on your preferences and schedule. If you complete the training and want to be assigned to a polling place, you will get additional materials prior to election day. Note: Poll workers are trained and assigned through the Voter Registration and Elections office located at 1515 4th Avenue, Conway (843) 915-5440. These are paid positions, and workers serve a 13 hour day from opening to closing of the polls. 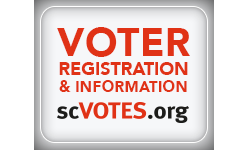 Additional info is available by phone or online at www.scvotes.org.